Dunford Doughnut for Lunch? | Fit Family Robinson | The world is your gym. Had a Dunford chocolate iced cake doughnut and cold cereal for lunch today. Safe to say that meal goes under the 10% column of my 90/10 eating lifestyle. Tee hee! Ain’t the norm…but so fun to break out now and then. Love that being Happy, Healthy and Fit for life is NOT about being perfect. 100% ain’t real, ain’t maintainable, ain’t fun! 2 Responses to Dunford Doughnut for Lunch? Exactly. I really don’t want to live in a world without donuts. 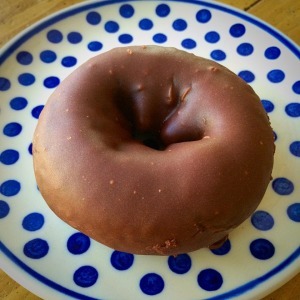 » Food » Dunford Doughnut for Lunch?